President-elect Donald Trump escalated a fight with U.S. spy agencies on Wednesday, just nine days before he takes over their command as President, and accused them of practices reminiscent of Nazi Germany. The Republican said leaks from the intelligence community led to some U.S. media outlets reporting unsubstantiated claims that he was caught in a compromising position in Russia. “I think it was disgraceful, disgraceful that the intelligence agencies allowed any information that turned out to be so false and fake out. I think it’s a disgrace, and I say that … that’s something that Nazi Germany would have done and did do,” Trump told a news conference in New York. Trump acknowledged for the first time that Russia likely hacked the Democratic National Committee and the emails of top Democrats during the 2016 presidential election. “I think it was Russia,” he said, pointing out that other countries were also hacking the United States. Trump’s comments about spy agencies such as the CIA are likely to intensify tensions between the intelligence community and the president-elect, who initially disparaged its conclusion that a Russian hacking campaign was aimed at boosting his candidacy against Democrat Hillary Clinton. U.S. Director of National Intelligence James Clapper said he spoke with Trump on Wednesday evening and told the president-elect he did not believe the media leaks came from the intelligence community. “I expressed my profound dismay at the leaks that have been appearing in the press, and we both agreed that they are extremely corrosive and damaging to our national security,” Clapper said in a statement. Clapper said he emphasized to Trump that the dossier was not produced by the U.S. intelligence community and intelligence officials have not judged whether the information is reliable. Two U.S. officials said the allegations about Trump, which one called “unsubstantiated,” were contained in a two-page memo appended to a report on Russian interference in the 2016 election that was presented last week to Trump and to President Barack Obama. CNN reported on Tuesday about the existence of the memo. BuzzFeed published a fuller 35-page document produced by Christopher Steele, a former British foreign intelligence official, that outlined the allegations of compromising behaviour by Trump and alleged links between him and people in Russia. The claims were included in opposition research reports that were made available to Democrats and U.S. officials last year. One U.S. official said investigators had so far been unable to confirm material about Trump’s financial and personal entanglements with Russian businessmen and others whom U.S. intelligence analysts have concluded are Russian intelligence officers or working on behalf of Russian intelligence. Some material in Steele’s reports has proved to be erroneous, the U.S. official said. In the news conference, Trump declined to answer whether anyone connected to him or the campaign had contact with Moscow during the presidential campaign, and said he had no loans or business deals with Russia. He defended his goal of better ties with Russian President Vladimir Putin. “If Putin likes Donald Trump, I consider that an asset, not a liability,” he said. The New York real estate developer complained about leaks from meetings he has with intelligence agencies and suggested they were to blame. “I have many meetings with intelligence. And every time I meet, people are reading about it. Somebody’s leaking it out,” he said. 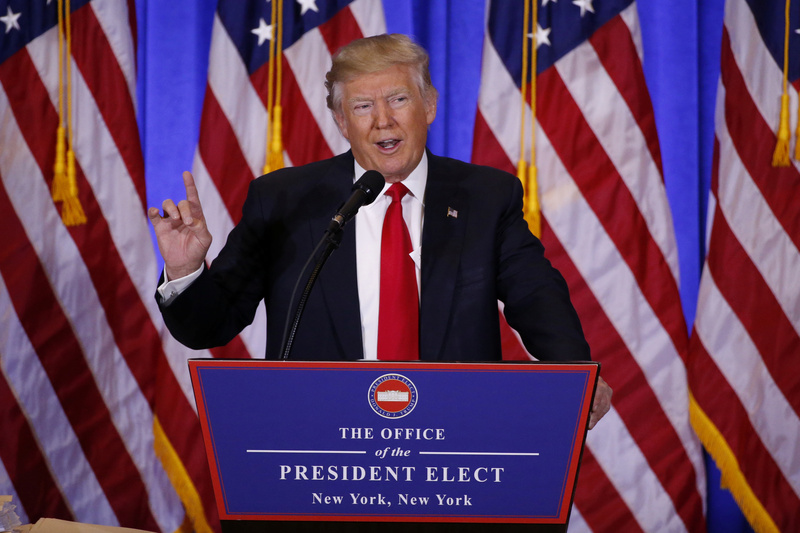 The long-awaited news conference was a freewheeling affair, with Trump aides cheering from the sidelines at one point and the president-elect angrily refusing to take questions from a CNN reporter. Outside, about a dozen protesters gathered behind a police barricade across the street from Trump Tower, holding signs with the slogans “Dump Trump” and “Allegiance To America Not Russia” as Fifth Avenue traffic streamed by. It was Trump’s first news conference in about six months and about 250 reporters jammed into the lobby at his Manhattan offices. Trump, who spent much of his U.S. presidential campaign bashing the news media for what he called unfair coverage, kicked off with uncharacteristic praise for the New York Times and other media organizations. The reason? The Times, and others, had held back on reporting salacious and unsubstantiated allegations that suggested Trump could be blackmailed by Russia. The praise did not last long. For those organizations that he said had crossed the line – BuzzFeed, which released an unsubstantiated memo about the allegations, and CNN, which was one of the first to report on the broader story – he delivered a scathing critique. “You are fake news,” Trump said to CNN correspondent Jim Acosta, calling his organization terrible and declining to take a question from him despite Acosta’s several attempts to shout one. That dust-up was one of many theatrical moments at the first news conference in six months for Trump, a businessman and reality TV star-turned-politician who enters the White House on Jan. 20. Trump’s team created some suspense when beforehand four aides walked to the front of the room and placed thick stacks of paper on a table. Trump would get to that later. At the start, Trump stood off to the side with his three oldest children while he had two introductions – one from his incoming press secretary, Sean Spicer, and one from his running mate, Mike Pence. Both slammed media organizations for reporting the unsubstantiated allegations. CNN later released a statement about its reporting. Trump stood in front of a row of American flags, using a presidential and patriotic display as a backdrop. As the questioning grew more intense, he brought up an attorney, who gave a long and detailed pitch on live television about how the business owner would attempt to avoid conflicts of interest. The lawyer’s presentation acted as a brief intermission to the frenzied pace. Once Trump was ready to end, he pointed to the stacks of paper by the lectern. 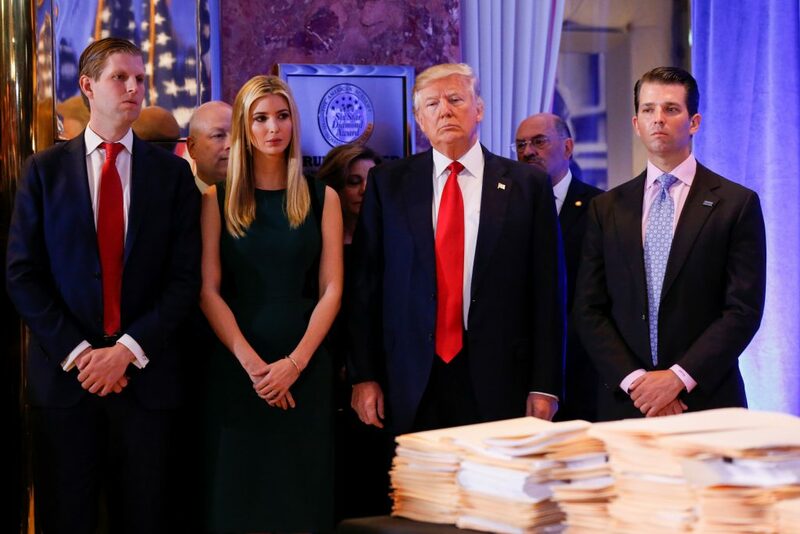 He said he was unsure it had been properly explained that they represented some of the paperwork he had filled out to begin placing his business in the hands of his sons so long as he is president, a maximum of eight years. 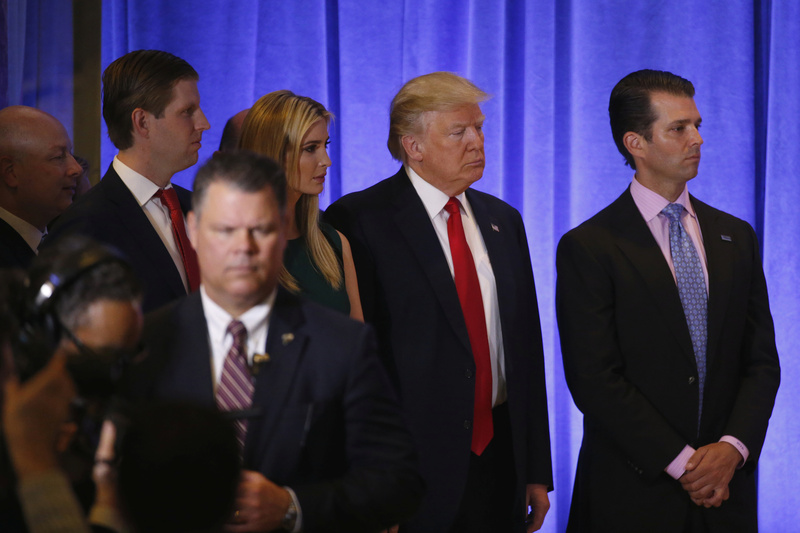 If after eight years of running his business he found the sons had not done a good job, he would tell them, “You’re fired,” Trump said, using a catchphrase from “The Apprentice,” the reality TV show he hosted. Questions extended to many issues that will face him when he takes office. He vowed to soon begin negotiations with Mexico on building a border wall and said he will nominate a Supreme Court justice to fill the seat left by the death of conservative Antonin Scalia within two weeks of taking office. He also said he would offer a plan to repeal and replace Obama’s signature health care law once his choice for health and human services, Tom Price, is confirmed by the Senate. 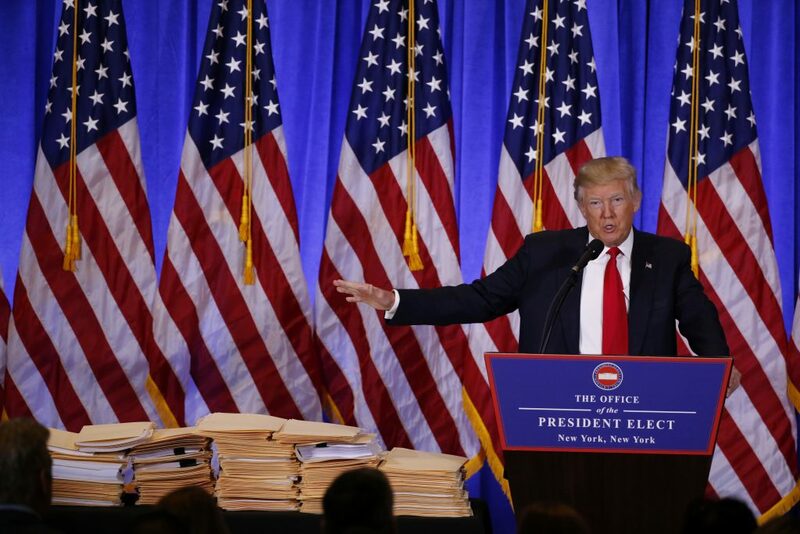 Trump gestured to large stacks of manila folders as he described how he will separate himself from his global business operations, which includes hotels and golf courses as well as assets like a winery and modelling agency, to avoid conflicts of interest once he takes office. He also talked about how he plans to bring manufacturing jobs back from overseas plants, slamming drug companies for “getting away with murder” on pricing. U.S. stocks slipped to session lows, before recovering ground, as healthcare stocks took a beating following Trump’s comments on drug pricing. Thomson Reuters Foundation, the charitable arm of Thomson Reuters, that covers humanitarian news, women’s rights, trafficking, property rights and climate change.